BEIJING — China on Wednesday urged ally North Korea not to cancel a historic summit between its leader, Kim Jong Un, and U.S. President Donald Trump. The call came as President Xi Jinping met with a delegation from North Korea's ruling Worker's Party, at which he expressed support for the North's avowed new emphasis on economic development, along with improving relations with South Korea. "We support the improvement of North-South (Korean) relations, the promotion of dialogue between North Korea and the U.S., denuclearization on the peninsula and North Korea's development of its economy," Xi was quoted as saying by state broadcaster CCTV. Neither CCTV nor the official Xinhua News Agency said whether the Kim-Trump summit was discussed. At a daily briefing, foreign ministry spokesman Lu Kang said North Korea and the U.S. should ensure the summit proceeds as planned and yields "substantial outcomes." "Only in this way can we consolidate the alleviation of the situation and maintain peace and stability in the region," Lu said. Kim and Trump are due to meet in Singapore on June 12, but North Korea on Wednesday threatened to withdraw, saying it has no interest in a "one-sided" meeting meant to pressure it into abandoning its nuclear weapons. North Korea's warning came hours after it abruptly canceled a high-level meeting with South Korea to protest U.S.-South Korean military exercises. China has called for the building of mutual trust through the suspension of large-scale U.S. and South Korean war games in return for a halt of the North's nuclear weapons and ballistic missile tests. Xi has met twice with Kim over the past two months in what is seen as an attempt to ensure China's interests are upheld in any negotiations between the U.S. and North Korea. Analysts said North Korea's threat to scuttle the summit is likely an attempt to gain leverage over Washington, which has demanded the North immediately and irreversibly cease its nuclear weapons program. In his meeting with Xi last week, Kim registered his desire for Chinese support in the talks, particularly his call for a "phased and synchronous" approach to denuclearization, as opposed to Trump's demand for an immediate end to its nuclear program. China is North Korea's most important economic partner and has long sought to convince it to follow Beijing's path of enacting free market reforms while maintaining tight single-party rule. At his meeting with Xi, the leader of the North Korean delegation, Pak Thae Song, said he had been entrusted with consolidating recent agreements between Kim and Xi as well as studying China's model of economic development and "reform and opening." "We will play an active role in carrying out our party's new strategic line of prioritizing economic development," Pak, a vice chairman of the Workers' Party Central Committee, was quoted as saying by Xinhua. 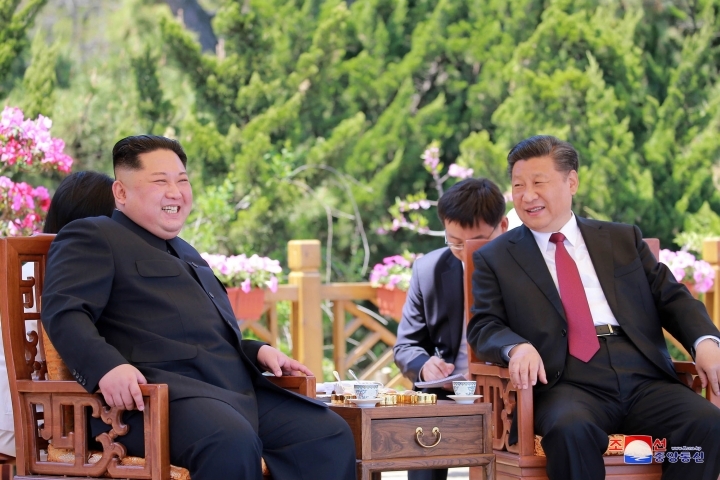 China-North Korea relations appear to have outwardly improved following Kim's March visit to Beijing — his first trip abroad since taking power six years ago. However, China's strict enforcement of United Nations economic sanctions are believed to have brought economic pain to the North, which suffers from chronic food insecurity and a shortage of fuel and foreign exchange to buy needed imports. Copyright © 2015 - 2019 Asia Logue. All Rights Reserved.